Total: 10 Min. | Active: 10 Min. The most tender entrecôte you have ever eaten: so creamy yet packed with flavour that your mouth will be watering in anticipation. The ingredients go together perfectly: the green-tinged marbling of the blue cheese combined with the distinctive taste of the walnuts and fresh herbs gives the meat that certain "je ne sais quoi" – there really is nothing quite like it! Mash the Roquefort and butter with a fork. Add the nuts, sage and parsley, season and stir until smooth. Season the meat. Heat the oil in a frying pan and fry the meat for approx. 3 ½ mins. on each side (à point). 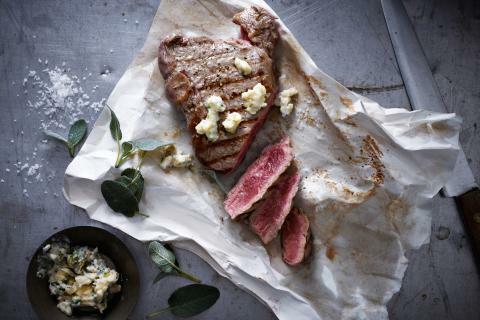 Serve the entrecôte with the Roquefort nut butter.